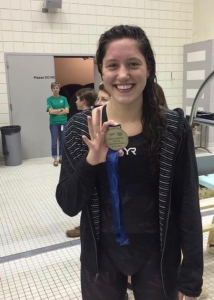 UVAC’S Hannah Cox ROCKS 2015 Junior Nationals! Hannah scored 46 points placing the team 19thoverall on the Women’s side at the Junior Championship. “I am extremely proud of the accomplishments by both UVAC swimmers this weekend. Hannah exceeded our goals for this meet by both breaking the New England records and placing first with outstanding time drops to break the 500 freestyle Junior National Record from 2008. It is no small feat to break Olympic medalist Elizabeth Beisel’s New England records, a goal we set out to do four years ago in Hannah’s last yard meet as a senior at the National level,” says Head Coach and Competitive Aquatics Director, Dorsi Raynolds. “Kristian accomplished qualifying for the meet in the 500 the week before at UVAC and our mission with him was to gain valuable experience to propel him into understanding the next level to work towards. Both swimmers have 100% attendance (16 hours a week) at UVAC practices and it is their work ethic and great attitudes that have them on the path to seizing their potential in this grueling sport, “says Coach Dorsi Raynolds. Next up for the UVAC Club is the New England Senior Championship at WPI in Worcester, Ma, Dec. 18-20. The local club has 11 individual qualifiers for this year’s meet. Last year the team had 3. The total squad will add 6 relay only swimmers to bring 17 athletes to the 2015 Championship. UVAC will field 14 relays to represent both the girls and the boys at the meet for UVAC, unprecedented for the UVAC team.